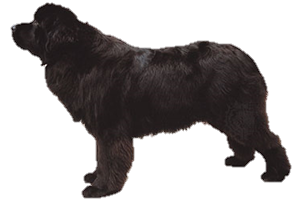 Today the Newfoundland is primarily kept as a companion or rescue dog, however it had a large range of duties in the past. It began it's history as a cart puller and draft animal before taking to life as a fisherman's dog. A natural swimmer they would bring in nets, retrieve anything that went overboard, carry messages between boats, rescue people from drowning and was even capable of bringing a line into shore from a boat if the sea was too choppy to land safely. The Newfoundland was developed in north-east Canada in the providence that shares its name, but how its ancestors arrived there is debated. Some believe they were developed from dogs brought by the Vikings around 1000 AD, or even more unlikely, that they descended from Tibetan Mastiffs that crossed over the land bridge with migrating tribes. It is more likely that they are a mixture of dogs brought in the 15th and 16th century by European explorers, such as the Great Pyrenees. These dogs may have then crossed with native Inuit dogs to create a basis for the breed. First known as the Greater St. John's Water Dog, it is closely related to the Labrador Retriever, which at the was known as the Lesser St. John's. Oddly enough the dog we know today finished its development in Europe instead of Canada. In 1780 Newfoundland passed a law making it so only one dog could be owned per household and this almost led to the breed's extinction. Today a second variety exists, the Landseer, which is classified as its own breed under the Fédération Cynologique Internationale. Is the Newfoundland Right for You?